Appendectomy vs. Antibiotics – Would YOU Randomize? I'm older and retired, and I would be willing to participate in such a trial. Surgery is also hazardous, and I believe it would be followed with IV antibiotics in any case. A co-worker had surgery last year for appendicitis and has had months of follow-on problems from the surgery. Seems like a non-surgical treatment would be good to consider, even though I am aware of overuse of antibiotics and antibiotic resistance. I assume IV abs would be used. That is far less invasive with a faster recovery - strikes me as worth a try. Although there are risks involved in both "surgery" and "antibiotics" there is usually a greater potential risk when undergoing a surgical procedure. Based on what was shared there seems to be compelling evidence to further investigate the best treatment option that is based on current research and evidence, in addition to clinical expertise, and patient's preferred treatment. Due to past history of arthritis and numerous surgeries to correct or gain relief including 2 hip and one shoulder joint replacement, I would prefer to avoid another surgery. I would consider being randomized as long as the fall back to an unsuccessful treatment with Antibiotics is surgical. I feel surgery should always be the last option. Because it is a reasonable clinical question and I would prefer a non-invasive treatment if outcomes were equivalent. To further science and medicine. I think antibiotics is a fair alternative. About time this study is done. I'm always interested in outcomes. I could still have surgery if not improving on antibiotics and would avoid surgery if it worked. At the worst, I would have a traditional appendectomy. Any chance of avoiding surgery, I would have jumped at. I did have an appendectomy, and all went well. Risks associated with surgery, lower costs associated with more conservative care, contributing to advancing medicine. I would gamble in Vegas on 65% odds of winning [(12+47)/2] and surgery is still an option if the antibiotics fail. I had acute appendicitis in the past. Admitted to a small, old hospital where my PCP had visitation privileges. His preferred surgeon wasn't available until the following morning, so I was put under observation overnight. Problem resolved by morning. I am assuming I would be under close supervision. Any opportunity to minimize surgeries when less invasive and equally effective methods can be used is ideal. Surgery is not without risks. Neither is appendicitis. Question however, is a ruptured appendix with more generalized peritonitis to be included in the trial or are those to be randomized to be in those suspected to not be ruptured? As long as I had the option for surgery if I was not getting better after a preset time. I want to be VERY sure the infected item has been removed completely. I would do so only if there was significant follow up and monitoring of the antibiotic arm. Less $, less time, less risk. Could always go to surgery if I don't get better (Treat like diverticulitis). Both have some clear advantages and are believed to be equal by some. However, the study would have to clearly define scenarios when is and is not acceptable to choose one treatment over the other, both at presentation and in case of recurrence. I had appendicitis attacks (2) in the 1970's as a young man. Both times I was treated by my internist with a large (massive?) does of antibiotic via IM injection. Both times the attacks cleared up very quickly. I am now in my 60's and have never had a recurrence. I'd rather evade surgery if possible, because complications are always possible. I would try abx for 1 to 2 days. I have worked on the business side of healthcare providers for over a decade, and the industry is slow to embrace change. For the potential for a better, less invasive treatment! My feeling is that if the antibiotics don't work, you would still be able to have the surgery, so it's not really eliminating surgery entirely as an option, and initially, you would be monitored in the hospital, so if symptoms didn't improve quickly, you could still have the surgery. So it doesn't seem me to be particularly dangerous in this circumstance to initially try the antibiotics. Since surgery is standard-of-care, being put in this arm of the trial would be fine as well. I would like to be a part of research that may change practice or confirm what we're currently doing is the correct way. There is no good in relying on dogma to practice medicine. I don't want unnecessary surgery. I would prefer to avoid surgery if possible. Want to know if antibiotics might work without surgery. For early stage uncomplicated appendicitis I think there is equipoise. And antibiotics on the market today are quite strong and effective. Do not tolerate surgery well so the explanation of what antibiotics could provide instead is a major factor. Multiple trials have strongly indicated that antibiotics are just as effective as appendectomy. I think it's good for science and medicine to reevaluate and improve long-held treatments and procedures. To help find an answer to this question. Some individuals with appendicitis would probably be better abx candidates than surgical candidates. Also, if this study demonstrated that abx were as effective, it would give us another treatment option. There's enough evidence now that I think antibiotics may be equivalent in some patients. The appendix is an important immunological secondary tissue and I think it is worth saving if possible. I do think, however, that patients should be monitored closely to ensure the inflammation within the appendix responds to the antibiotic treatment so that the appendix do not rupture and risk the life of the patient. Only if cost of the antibiotics or surgery was covered. Concerned about long-term impact of abdominal surgery, even laparoscopic. Also a physician researcher and I think it's a cool idea :) My question is this, though: what data do we have in terms of who is likely to progress? Your ranges are pretty wide. Can you provide patient-specific risk as part of the trial? I would consider a less invasive option for treatment if given the opportunity. I figure you have nothing to lose by trying the antibiotics first and if that doesn't work then surgery would be the second choice. I'm interested in avoiding surgery, and this is an opportunity to potentially have an alternative treatment. I know that going to the ER is more likely to result in surgery, but this study increases the possibility I would receive what could be another just as effective treatment. I chose this answer because antibiotics are less invasive than surgery. If antibiotics have worked in other research studies, why not try it out? Because I've read about the studies in Europe and I believe we need to settle this question. I work in emergency medicine and it would be great to see appendicitis managed with antibiotics rather than surgery. I find the results of previous studies reassuring. Also, in a controlled environment, I believe the risk of withholding or delaying surgery would be acceptable to me. Surgery is a onetime solution rather than going to antibiotics which takes more time. I would prefer surgery first. Neither is indisputably a better treatment option than the other. Roll the dice, and use accumulated data to make a final determination. The risks and benefits of surgery versus antibiotics appear to be different but similar levels of magnitude -- I would probably be fine either way. Maybe there are more potential complications with surgery but I would not be likely to have a second occurrence, while the antibiotics would be less invasive but there is a 25% chance I might need surgery anyway. I am also supportive of research and know that *someone* needs to participate in studies! The both seem to be as risky and have the same benefits. Might as well help research. They both seem safe and viable to me. I am having trouble deciding which one I would choose. So I have no problem leaving the decision to random chance. Both have benefits. Surgery is invasive. Was not told about antibiotics by my doctor. After discussing the options with my doctor and upon further research, I would be confident in whatever decision to be made. Since none of the reviews appeared to be too convincing, I think that it would be a toss-up between the two choices. I did not know that antibiotics can cure the disease completely as surgery. Hence, why go for surgery when antibiotics can treat it. Surgery is advisable only when antibiotics do not work. Both options have the same amount of pros and cons so it wouldn't matter to me. I think that both options are viable. The risk on each side is very similar. I don't mind helping science out and participating in the study, though I do have a slight preference for antibiotics because I feel we should leave the bits of our bodies in our bodies, even if we don't know what they do. I bet they do something, though you may not need it now. I feel as though the risks are fairly small. I believe both choices are about equal when you compare the risks. I would be willing to try either one the doctor feels would be better for me. I do not mind participating in studies. Yes. I would agree to participate in the randomized study because the options of surgery or antibiotics are too difficult to choose. For some patients, surgery is a must while others are liable to recuperate well with the help of antibiotics which is almost taking a chance (either yes or no) on the treatment. I am still young, and I believe that the risks I would encounter during surgery are low. I am interested in seeing what antibiotics can do because it's less invasive, and if it doesn't work, then I can have the surgery. Complete treatment in less time. If I had appendicitis, would likely to go with surgery first. I prefer Antibiotics more than a surgery. I think the antibiotics might be a good thing to try. Surgery is expensive and risky. Assuming everything is well researched and appropriately IRB approved, I have no qualms about trying the antibiotics treatment, and if that doesn't work, opt for the surgery. Well I think I would like to share what I had experience so other people can learn from it, however we all have different ways of handling things. Time and cost, vs recovery. I'd want to avoid surgery if possible, but it sounds like the antibiotics could take longer to work and be less effective in the long-term. The pros/cons of each option seem equal to me, and I'd participate in a study like that if I felt like it could help other people in the future. The worst cases for either aren't too bad and it’s worth it to find the best one. It could go either way, I could opt for antibiotics, and then still have to have surgery, or I could have surgery first. I think research is very important, so I would participate. It's better to know the method of treatment that would be convenient to patients, rather than being uninformed. Randomness is a major part of reality. Also it seems that there are uncertainties in both treatments. I am willing to help science. Surgery is always risky so first try antibiotics. My decision was influenced by the worst case of the antibiotics method of curing appendicitis. The fact that without these trials and studies we truly will not know the absolute most effective method of treating this health issue. We must begin somewhere and the data can be collect and very useful. I will surely participate in the study. I had appendicitis and underwent surgery. To be involved in a study that could possibly help advance medicine. Low pain and easy treatment is the best one, so one should try antibiotics first, if it doesn't cure then try the other option of surgery. I believe that either treatment option (surgery versus antibiotics) would both foster in the desired results for me. The two options are equally informed clearly so it is easy to decide what is apt for me. I believe in helping with trials. Even if they don't benefit me, they may benefit the whole of society. This is a very good research topic because I know several people who have had surgery for appendicitis. Since I have an appendix, I would really like to know more about this study. To help in research and find the proper cure. I would like to be a part of study which could improve the treatment techniques. The study is helpful for medical students and doctors as it has great information about the human disease which could affect their health. I want to contribute to the medical world. Neither seems like serious complications could occur. If they both work I'd be open to it. Avoiding surgery would be my desire, if at all possible. I would be willing to be randomized because if I'm given surgery I will most likely be fine for the rest of my life. If they decide to give me antibiotics they will either cure me, or they won't work and I’ll have the surgery and be fine anyway. I would be ok with either direction. They both have their equal pros and cons. Both options seem to have an equal amount of risk vs. reward, so I would not be too concerned that I made "the wrong choice" so to speak. I'm not a fan of surgery or being put under. I would rather have the surgery. I think I'd like to help a medical trial. I think there is a good chance at cutting out a major invasion in the body by using antibiotics and if I was being monitored properly it would best to try the least invasive approach. As long as I was getting paid for the study I wouldn't care. I would choose surgery to get it done with and go on. Would not want another flair up, perhaps while in a submarine! Surgery seems simple with easy recovery. 24-48 h of IV antibiotics means that you would be in the hospital longer than the surgery option. And the problem may recur. My opinion could change if I knew more about the specific risks of surgery. But I would prefer to just have it over with. Appendectomies are typically safe procedures and uncomplicated (as long as the appendix has not ruptured), especially if done laparoscopically, on otherwise healthy patients. Antibiotics may not be entirely effective and many patients are non-compliant with antibiotic treatment, increasing antibiotic resistance and not necessarily eliminating the source of the problem entirely. Don’t want to take a risk. I think role of antibiotic is only for catarrhal appendicitis and for obstructive and gangrenous is operative. But still, even for catarrhal appendicitis, I would like to go operative intervention because it is better to remove it rather than keeping your mind on appendix always. After reading the blog article, I feel I would opt for the antibiotics treatment first, as myself the patient would be in the hospital and would be monitored in case of any further more dangerous problems. I chose “no” because I have had Appendicitis and it took nine months before the doctor knew what was wrong and then it was almost too late to do anything about it. I had to have surgery in order to be healthy again. Plus if the antibiotics didn't work there is always a possibility that the appendices would erupt. Then you would be in more trouble than before. I would rather not take the chance that I might have to have surgery in the future despite treatment with antibiotics. It looks like there is a pretty high percentage of people that fall into this category. If I were a 'normal' person I would participate. I'd try the antibiotics. If they work, great. No surgery and associated risks. But it seems like there is a high (35 percent?) likelihood that surgery might be required later and at short notice. I wouldn't be willing to accept that risk since there is a reasonable chance that, at that point in the future, I might be deep in the wilderness, at sea, in a country with poor medical services, etc. Since I frequent remote areas and places with poor medical care, I would have to decline the study and go with the gold standard, an appendectomy, at the first instance of appendicitis. Surgery works. I wouldn't want a 47% chance that I will need surgery on the appendix anyway. Just take it out, and research more important things. "a chance that an individual will develop appendicitis in the future and eventually need surgery within 48 hrs (12-47%)or sometime after (9-35%)." Given the above stats, hospitalization costs for antibiotic administration + cost of eventual surgery within 48 hrs increases overall cost while patients have longer hospitalization or readmission. Patients with appendicitis are often in severe pain which may not be an optimal time to propose a clinical trial of this nature. I'd have to have the statistics, results of trials. I have never heard that ATB's alone could treat appendicitis. What is the recurrence rate? High probability of needing surgery in future after abx-- why treat the same dx twice when you don't have to? Two chances for AEs. The risk of still needing surgery is so high that you might as well get it to avoid the even higher damage that can result from a perforated appendix. Failure rate of non-operative management 40%, those patients have lots of complications afterward and often can no longer be manages with laparoscopic appendectomy. My son nearly died from a burst appendix and he was on antibiotics at the time. I would not be willing to go only on antibiotics. Take the thing out. Wouldn't want to take that big a chance. I would be too concerned whether or not antibiotics would work before serious complications occurred such as rupture of the appendix. I would also prefer the finality of the surgery rather than suffering recurring episodes of appendicitis. I want to make the decision of which treatment plan to pursue myself, after having all relevant info. I would want to try antibiotics first, and use surgery as a last resort. I would not participate in this study. My apprehension is in the severity of this condition if left untreated. I am saying “untreated” in the event antibiotics are not effective. There is not yet enough data to show that antibiotics are effective. I am a proponent of advances I medicine, however; the uncertainty in this study is too high for me to accept. I find laparoscopic removal a far more effective, minimally invasive option, and one with a permanent result. I'm a surgeon and I believe the risks outweigh the benefits in my review of the literature. Limited as it is. I've had appendicitis. Appendectomy is a GREAT operation and I would not want to risk a burst appendix or recurrence by treating with antibiotics alone. When I had appendicitis I would have wept if they gave me antibiotics. I wanted that pain gone, gone, gone. Because the massive doses of penicillin I received for appendicitis contributed to an allergy to the medication and did not remove the need for surgery. Would not want to risk the ruptured appendix. I wouldn't risk the peritonitis that follows a ruptured appendix. I would be afraid of the appendix bursting before the antibiotics cured the infection. Had appendicitis and wouldn't want to take a chance on sepsis once they burst. If I ever develop appendicitis, I just want my appendix taken out. Many cases can be treated with antibiotics successfully and the recurrence rate after antibiotic treatment is somewhere around 10% last time I checked the literature. However, given how simple a surgery an appendectomy is and that it gives definitive treatment without the risk of recurrence I'd rather just have it taken care of permanently. Additionally, antibiotics are not risk free and if they fail it would only prolong the days of my life spent dealing with appendicitis. Why would I want prolonged pain just to see this work? I would prefer to start with antibiotics than taking the chances of post-surgical complications, such as infection which I would need antibiotics for anyway. And I won't be left with a scar on my abdomen. Appendicitis is a surgical disease. I would opt for appendectomy. I am unconvinced of the superiority (or even the non-inferiority) of antibiotics for acute appendicitis. Up to a 47% chance of undergoing another painful bout of appendicitis, this time requiring the operation for sure, all for the possibility of preserving a vestigial, useless organ just doesn't make sense to me. I want the appendix out! The nominal risk and recovery from a lap appy for uncomplicated appendicitis is far less than the likely prolonged illness and recovery with non-operative therapy. I believe surgery is the most conservative and safe course. The complications of other treatments have been substantial in my practice. Most of the subsequent problems are not reported in the literature. Appendectomy is the gold standard treatment for acute appendicitis. Why avoid a same day or a 23hr obs surgery that will definitively fix the problem when the problem could pop up anytime in the future...everyone tries to compare appendicitis to diverticulitis bc the pathophys is similar but one requires a colon resection and one requires a 15-30 min operation. There is no comparison between the two diseases...and what do you do if abx dont work? Surgery. But I do applaud you for attempting this study. I hope the interest is there. When conducting research, there is no guarantee. I'll always go with the "sure" and guaranteed procedure, which in this case is surgery. Appendectomy is a onetime fix, the idea of recurrence after antibiotics would be enough of a risk to make me unwilling to participate. Surgery is too easy, quick, and safe. I would not want to risk unsuccessful medical management, or days of walking around with discomfort and the anxiety of an uncertain outcome. 1. IV ABX is a 4-5 day hospital stay with multiple labs. 2. Surgery patients are discharged in 12-36 hours in nearly all cases (immediately after surgery for most patients). 3. After watching the clinical improvement after surgery compared to before surgery, I cannot imagine patients would be willing to tolerate the pain of acute appendicitis. However, It would be nice to have a randomized trial that would give us an option to treat in benign cases. To me, the antibiotic treatment option was framed more negatively than the surgical option. Phrases such as "Under the best circumstances," made it seem that one could expect less than ideal outcomes from antibiotics. The presentation of numerical data for the antibiotics treatment, but not for the surgical treatment also made the antibiotics treatment seem more risky, because I could see the chance that I would have to have surgery anyway. I would like to try antibiotics first before taking an organ out. This type of study, while I understand is important, does not allow for that choice. I would rather deal with the problem permanently so I would opt for surgery. I also have concerns about growing antibiotic resistance. Would this treatment option worsen this issue still further? I would prefer to have the surgery and have the problem dealt with completely, rather than do a course of antibiotics and still have the risk of surgery down the road. I prefer to be operated. The risk of appendectomy is low and surgery is curative. A 12-47% chance of needing surgery within the 48 hours seems high enough that I would not want to put myself through an inconvenient and potentially expensive 2-day inpatient round of drugs just to have to end up in surgery anyway. I might be swayed if the cost to me for the antibiotics and potential surgery were less than the cost of surgery alone. Also why do we need to do a US trial if European trials are showing success? I agree with appendectomy. And being old-fashioned. Assuming no rupture/abscess I'd prefer lap Appy to abx. Treated faster, no recurrence. While antibiotics in some cases (like being on a submarine) is very useful and lifesaving, I am afraid that it is and would be abused by being used too much. Thus creating potentially more devastating antibiotic-resistant diseases/illnesses that could not be cured. Also, the life-threatening possibilities of appendicitis, to me--means that, if infected, needs to be removed. The antibiotics cure is not always fool-proof--and you may end up having an emergency appendectomy anyway. In my case--I say--just cut it out--save the antibiotics for a more critical patient--or time when it is absolutely necessary. Assuming uncomplicated appendicitis (no rupture or intra-abdominal abscess) I'd prefer surgery to cure the disease and eliminate the chance of ever getting a recurrence. It has been my experience that a higher level of personal care is available to patients outside of medical studies. I would not be absolutely adverse to trying the antibiotic but would prefer to be treated outside of a study. I'd rather have the fast, decisive way to treat the appendicitis. I think there's too great a risk with the antibiotics that the appendix will burst, causing peritonitis. As a woman, that's a huge concern for me. Further, antibiotics can cause c. difficile, which is awful and very hard to cure. So I'd go with the surgery. I am certain I would want the antibiotics first. Cutting people open and knocking them out with anesthesia are both too dangerous to risk if there is a reasonable alternative. I do not like to take chances. I would feel best with surgery because it gives you the best opportunity to remove the pain and have the least complications. I would not participate in any randomized study when dealing with a potentially life threatening condition. I prefer to have complete control over my medical decisions. I want surgery. I don't want to have to think or worry about it again. Get it out and get it over with. I would want to do antibiotics first, as I am generally in good overall health and doubt that I would develop appendicitis again. I wouldn't want to deal with surgery unless it was absolutely necessary. I would prefer the surgery, in order to not have to maybe go back to the hospital on the following year. At least with the surgery the appendicitis is gone. I would not want to leave a decision such as this to the flip of a coin. I would want to make an informed choice weighing the pros and cons of each procedure. I would want to get it over with as soon as possible and not risk any further pain or surgery in the future. In most cases, the surgery poses no problem. I would prefer surgery, the antibiotics seems like a lengthier hospital stay with a greater chance of developing it again. Dislike the overuse of antibiotics - oral antibiotics does affect one’s own internal digestive environment. Want things done quickly so I can move on. The idea of letting appendicitis just sit and hope it is taken care of by antibiotics is not what I want to do. I would rather just have surgery. What influenced my decision the most is knowing I would choose surgery, I would not want the 50% chance I may have to take the medication. I would do the antibiotics first because I don't want to go under the knife. I wouldn't want to be randomized, I choose the antibiotics wholeheartedly based on the info you provided! Why undergo anesthesia and full blown surgery if it is avoidable??? Drugs! Give me drugs! The fact that surgery takes care of it and you get to go home the next day. I would simply want to have surgery to get rid of the appendix. As long as it's still there, it could get inflamed again. I would choose the surgery first so I would not miss out on work or school. My body does not work well with antibiotics. I like the surgery approach so I could just get it over with. Don't like the loss of control. I would definitely try antibiotics first. I would want surgery first. The facts. Antibiotics are still being tested to determine if they will be a more than temporary solution. 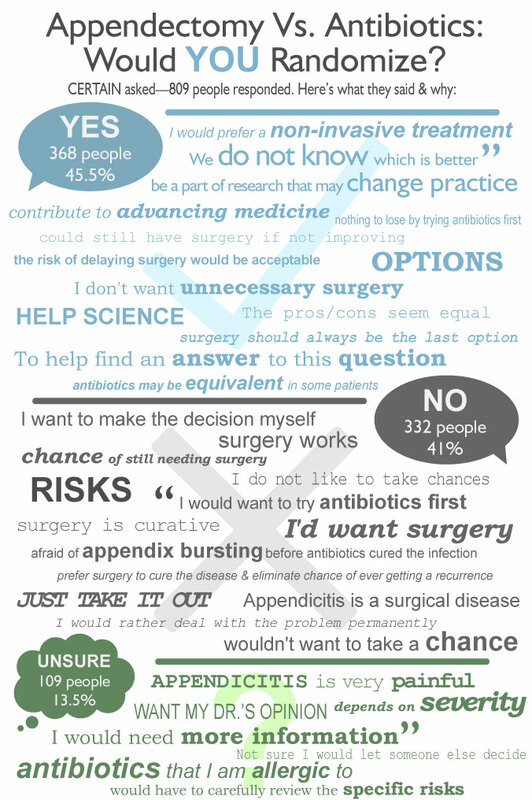 The chances of getting appendicitis after antibiotics is 25% and that is a fairly high number. I feel that I should be in complete control of my own body and my health care choices. While complications from surgery occur -- antibiotics can lead to a whole slew of other complications, not to mention you may be allergic. Surgery is just a better overall option for people in this case and it reduces the risk of causing antibiotic resistant microbes or killing good microbes in favor of bad ones -- like c. diff. The use of antibiotics treatment still seems to be at the research stage. In the antibiotics first approach, you are in the hospital longer (vs. if everything goes really well with surgery first) and there is still a chance that you need to have the appendix removed anyway. So, why take a potentially "extra step" when it might be better to just remove it right away. There could be a few more days of down time and some risks. But surgery has been done for roughly a century and so there are many records. The appendix can't be a problem again (albeit it could require more surgery in the event of complications). The best case and the most likely case seem convincing. Also the fact that antibiotics have over 50% success rate also reducing the duration of stay in the hospital. Currently, an appendectomy is seen as a less complicated surgical procedure compared to other types of surgery. To take the chance of re-occurrence and of the risk developing side effects of heavy antibiotic dosing would not be an acceptable option for me. I will choose surgery to get rid of it. Although the chances of having it again seem low, I won't risk it. I want to be able to have a say in which treatment option I receive. I'm a lab tech by training and I've seen too many hot appys go bad. I want the darn thing taken out! As a side note, my late husband died of neuroendocrine cancer which often originates in the appendix silently. I just want this useless appendage removed. I would choose surgery because antibiotics are new and I don't want them to be tested on me! I prefer an approach that guarantees no recurrence of appendicitis. The Risk involved in taking antibiotics is much heavier than surgery. I would opt for the antibiotics approach personally. I would take the surgery. It's tried and true, if you pick a good dr/hospital you are likely to have an easy time, and you'll never have appendicitis again. I have allergies to antibiotics (severe rash). Were I to go on several courses of antibiotics, I would likely end up with a secondary illness of my skin related to the antibiotic treatment. I would definitely try to avoid that. I wouldn't want to depend on a 50% chance of having either surgery or antibiotics. I would want to do what was best for my condition. I would rather look at pertinent facts at the time and make my own decision. Flipping a coin to decide does not make any sense in my opinion. I would want antibiotics first. I would prefer surgery based on all the information given and I would not like to take the antibiotics. Also I wonder if there is any merit to a concern about taking too many antibiotics, and whether or not this could be a problem in the future because of this treatment. I want to make my decision on my own. I would choose antibiotics first. It seems that there are many factors that would influence a patient's decision to choose one over the other. Each patient's situation is different. I would want to try "antibiotics first", and wouldn't be willing to take a 50% chance that I'd be selected for surgery. I would prefer to make my own decision rather than leaving it to chance. I would want to choose antibiotics first and not have to deal with random chance to get that option. If I didn't have a 100% chance to take the antibiotics option, then I would most likely participate in the study. I would want to avoid surgery as much as possible. If in taking the antibiotic there is still a chance appendicitis might return and you have to have surgery anyway, I'd rather just do the quick surgery and be sent home. I would not want to leave something as important as a treatment approach to chance. I would prefer to take the treatment that i feel is good for me. I have strong opinions against surgery whenever possible. I would definitely choose surgery. I do not want an infection to spread into my bloodstream. Personal health is a bit too important an issue to leave to a randomized chance on surgery or antibiotics. I would prefer to be able to choose which option is best for me. I would rather make the choice myself. With antibiotics, there is about a 1 in 4 chance that surgery will STILL be needed in about a year. I'd prefer to have complete control over my medical decisions. My experiences with surgery have not been very satisfactory so I would try antibiotics first assuming my doctor thought that I was a good candidate for that approach. I'd like the decision for my treatment to be up to me completely and not left to chance. A random study might not provide the optimum choice for me. I would prefer to have surgery and get it over with. I don't like the idea of it possibly not getting better or coming back later. Me and my doctor would make a decision, depending on my overall health. I have no medical insurance or sick leave and make very little money, not being able to miss any time I can work, so I would have to go with the antibiotics option. In addition, I would always prefer to avoid surgery if possible. I would most certainly choose antibiotics first. Taking antibiotics is not very common. So I don't want to take chances like a guinea pig. Surgery permanently relieves us from the disease. First use antibiotics, but in the case of severe pain or inflamed case surgery is the best option. I would choose antibiotics first. I don't like the random nature of this study. I want to be able to choose for myself. I would prefer to decide for myself or have my doctor decide. I'm more surgically oriented. We don't think the appendix does anything specific, and I would hate to have to come back for surgery later. Besides, there is no guarantee that I wouldn't get appendicitis later. Based on the information presented, I would definitely want to try the antibiotic approach first. I think it is less risky, and ultimately surgery is always an option. The likelihood of requiring surgery after trying the antibiotic treatment. I would not like to be a guinea pig for randomized experiments. I think I would like to go for surgery. My response is influenced by the fact that 1 out of 4 patients had to get surgery done after taking antibiotics first. I don't to gamble on a decision where it can affect my health. I would much rather go with surgery because I trust the technology and doctors nowadays. Medicine is not always a guarantee. I would want the antibiotics first because we believe now that the appendix may repopulate your gut with bacteria so it does serve a purpose and it's best to not have it removed if you can avoid it. I would rather make an informed decision than leave it up to fate. My life schedule, cost of treatment, and pain will influence my decision about treatment. I would not want to have a randomized decision made for me because I would strongly want to have antibiotics first (I have had a bad experience with surgery in the past and would always try to avoid surgery if another approach is possible). I would definitely prefer the antibiotics. I think I would want to get it over with and have surgery. I don't think I would take chances with the antibiotics. I would not put chance to my health and would pick the option that would be best suitable for me at that time. Why take a chance of getting worse when surgery will do the job for certain? I would rather have surgery because it is more effective. I think the risk factors influenced me, especially knowing how things are treated in other countries and the risks of surgery in general. Apparently 1 in 4 people who try antibiotics first end up getting surgery anyway within a year. If there's a 25% percent chance I'll have to go through it all again, why not just have the appendix removed in the first place? I would want to be in control of the decision I made. I would want to do surgery first and wouldn't want to sit around for 24-48 hours taking antibiotics while in pain. If I'm in a situation where I'm having appendicitis I wouldn't want to take part in a study. The only thing I would want would be the removal of the pain. Surgery seems the quickest route to pain removal so I wouldn't want a coin flip determining that for me. My father had the surgery and was back to work in 2 days. I want to make the final decision based on what I and my doctors thinks is right for me. I'd rather try and fix it with antibiotics before removing parts that could induce greater issues later on. I'd rather just have the surgery and get it over with. I would like to make my decision, not the flip of a coin deciding for me. I'm not the gambling type. I think every part of the body has its use and so any surgery is major and something to be taken very seriously. If antibiotics can get similar results without opening the body up, I think it's a good option. I want to decide for myself. Based on the facts surgery definitely seems like the best option. Also I have had appendicitis and had my appendix surgically removed and felt back to normal rather quickly with no complications. I understand the importance of randomized trials, but I would not be willing to participate in an experimental study while in need of acute care. I always prefer no surgery if it is an option. I'd rather not take the risk. I would choose the antibiotics so would not want the 50/50 coin toss. I'd want to make the decision! I would personally rather just have the surgery first, even with medical complications the risks for me seem less. I would rather get it over with and never have to deal with it again. Not sure I would want to let someone else decide if I should have surgery or not. Recently in Connecticut a woman with an inflamed appendix was given antibiotic because she was obese and had heart issues at the time that surgery was considered. She has recovered well. It is my understanding that antibiotic therapy is routinely used on some patients in Europe. I would need more information about which antibiotics would be used and what side effects are possible or likely. I would have to very carefully review the specific risks inherent in the study protocol. I understand the risks of the surgery. Having had my appendix out in 1983, in SE Asia, due to it's being long, wrapping around my intestines and disrupting digestive tract, surgical excision was probably the right call. However, I developed a significant local infection. Surgery has its risks, if anyone I knew had appendicitis but was not considered at imminent risk of the appendix bursting, antibiotics would seem worth the chance, with the expectation that surgery would be performed if the antibiotics did not work fast enough and/or other surgical indications arose. I was an Independent duty Navy Corpsman on Nuclear Submarines, we were trained to assess for appendicitis and if Positive utilizing an algorithm:1: I.V. Antibiotics, 2: pack abdomen in ice, 3: NPO x 24 hours the clear liquids depending on tolerance and gradually advance diet per protocol, 4: Bedrest x 1 week, 5: when returning from Patrol (could be several months) refer for CT and determination by Surgeon for elective appendectomy. We were instructed that this had been Standard of Care in Great Britain for many years. I have utilized this approach while at sea and never experienced any untoward problems. I would be most likely willing to participate, however, I have a lengthy list of antibiotics that I am allergic to. My only concern would be that I would have a reaction to the drugs. I'm unsure because I think it depends on the severity of the case. If my appendicitis was extremely severe, I would for sure decline the randomization, especially with the potential recurrence in the future. I would opt for surgery knowing I would not have to undergo repeated treatments in the future. On the other hand if I don't feel as poorly, I could see myself taking medications and perhaps be okay with randomization. Depends what kind of antibiotics. Having had my appendix removed in the 80s when the surgery was more involved, it is hard for me to answer this question. If someone would have offered me antibiotics then, I would have jumped at the opportunity to avoid surgery. However, having had the surgery, there is some peace in knowing I never have to worry about my appendix again. Surgery first seems to be more effective. Also there is the fact that antibiotics are becoming less effective in general and I believe should be used only when absolutely necessary. I'd need to speak with a doctor first. I would want to decide for myself, not by the fate of a randomization. I worry about the side effects that a medicine might have on me. I'd probably err on the side of trying antibiotics first…Not sure if I’d do the randomized choice. I am not sure what I would choose. I think in the moment, it would depend on the amount of pain and worry that I was experiencing whether I choose surgery or antibiotics. I would have to be in the situation to fully state I will do this or that because for example I have 2 relatives who's had appendicitis and their reaction varied. The 8 year old took the pain like a champ; however, the 16 year old was crying like a baby. So, I guess it will depend on the situation and the severity. I may do it if I were paid. It all depends on how severe my appendicitis was; also antibiotics don’t seem to be that great in treating appendicitis. The 1 in 4 chance of having surgery after the antibiotics is a huge factor. My already formed distaste for surgery. I never knew that there was an alternative to surgery and if I ever get appendicitis I will be asking my Dr. about the antibiotic approach. Given the information, I would rather choose surgery on my own. Personally it seemed to be the best choice, for me at least. I'd have to see my doctor's opinion. I don't like to leave my medical care to chance. I would want more information. Well, it's still tough to say- I would want to consult a real live doctor about my individual circumstance first. I would have to think about it. I don't want to develop a resistance to Antibiotics, I don't know which they use. Also, I would want to have a full physical to address any health concerns if I was going to pick surgery. I would not like to put my life on a gamble. The largest and most recent of the prospective randomized trials included 523 patients (23). It showed that the operation time for laparoscopy was longer (+ 25 minutes) but patients had less pain and recovered quicker (- 1 week). There was no statistical difference for hospital stay or sick leave. I would definitely want antibiotics first, surgery as a last resort. I'd really want the abx approach first, mainly because I recognize the potential dangers of general anesthesia (having worked as a vet tech). So I wouldn't want to be in a randomized study, but would be willing to be in a study that tried the abx approach. (Interesting family history: my grandfather died of appendicitis while waiting in a hospital for the surgeon to arrive). I will act only as per the order of my Doctor. I need to know the benefits of participating in the study. Antibiotics is an easy recovery. I selected unsure, because after reading the material (specifically, the first, side by side comparison), I would elect to try the antibiotics first, so I wouldn't want risk being put in the surgery group. I would consider it though, since I am a fellow researcher and understand the importance of such randomized studies. I don't think I would let some surgeon randomize the choice for me. I want to feel in control and be helped to make a choice that has the best chances of helping my specific case, whatever it might be. Depends on the situation. Risk of surgery is complications from anesthesia and risk of antibiotics is surgery. I'd rather go with the antibiotics. Not enough information; I would consult a doctor first. I'm not a real risk taker, just going with the information I have at hand; I'm not sure what I'd do. I think it is a critical question and I will think about when I have appendicitis. I think I will always prefer surgery. Both have lots of pros and cons, good and bad points. It's hard to tell which way I would go. I cannot predict how I will behave when I am suffering from pain. They both have pros and cons. Each has its own inconveniences. There will be pain in both. For me personally, sometimes I don't react well to some medicines. It would be something I would want to read a little more about and take time to consider. I'm not terribly sure if I'd want to participate in such a study. I might just because these options both seem to be viable. It seems like surgery and antibiotics both have pros and cons. Personally I would speak to a physician before deciding which option to take, and would not leave it up to chance. Not sure, I think I would just like to have full control over the decision myself. I think I'm leaning more towards trying the antibiotics first though just to see if it would be possible to resolve the issue without surgery. It would depend on how my doctor felt, since each case is likely to be different. I'm not sure what my decision would be. Because it depends on my actual case and situation so it's hard to say.